With our package of samples of magnetic sheets you can quickly find answers to all your questions, when working with a new project. 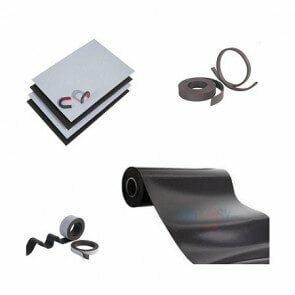 The variety of samples gives a good overview of the different types of our flexible products, as it is possible to assess the material, quality and dimension. If you wish something more specific from our selection of ferro sheets or magnetic sheets, please leave a note in the comment box when you are at the checkout page. If you need any further help, please contact our sales department. We are always open for suggestions to our sample packages or variations thereof.